It’s hard not to like the design of this large Windsor overlap shed. Typically you’ll notice the majority of overlap sheds have a pretty unappealing, rough design. This one however has a more rustic, authentic, stylish look. Though it still has a rough-sawn style, it is definitely more attractive than a lot of its competitors. There are also some great features which help to set it apart. The fact it comes without windows makes it better suited to more expensive storage. 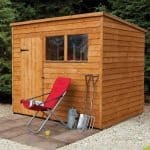 It also makes the shed ideal for use as a workshop; giving you total privacy to work in peace. Though if you do plan on using it for this purpose we would suggest boosting the strength of the floor. Like most overlap sheds, a solid sheet floor is used and it isn’t recommended for heavy storage. There are large double doors added for substantial access into the shed. They have also been braced for extra stability and prevention of sagging. A button catch is fitted onto the doors to keep them tightly closed when you aren’t using the building. An apex roof gives the shed a tall, spacious interior. It also helps to successfully drain rainwater away without the risk of it settling on top. It also comes with a 10 year anti-rot warranty for total peace of mind. No security is added to the doors of the shed. Adding a lock isn’t going to be too expensive however. 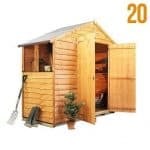 This is a very affordable, low budget shed with a high quality design. 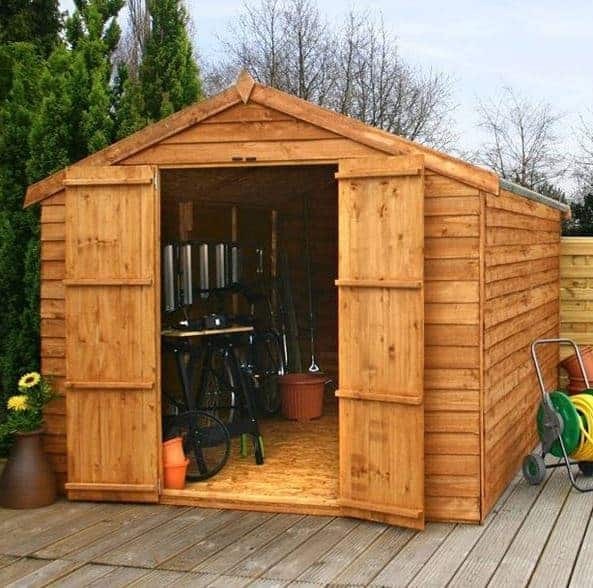 Offering an outstanding height, it is one of the tallest, as well as the most spacious storage sheds on the market. Technically its size makes it an ideal choice as a workshop too. However, the lack of windows would pose a problem so you’d want to choose the windowed version instead if this is what you are looking for. The door opening width and the ridge height are the most notable measurements here. The doors are wider than average and the eaves are shorter. The smaller eaves height won’t affect the shed’s usability at all, but it does give it a slightly more unique design. Due to the large width of this shed, the apex roof has a longer, gentler sloping design. It has a slight overhang at either side to prevent rainwater running directly down the cladding. Weather resistance isn’t the only benefit of this apex roof however. It also increases the height of the building compared to pent and flat roof types. So even if you find you’re taller than most, you should still be able to walk around inside this building with ease. The entire interior is created with solid sheet materials. 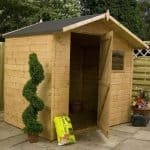 This is standard for overlap sheds and really helps to lower the overall cost of the shed. It may not be as strong as tongue and groove, but it’s still solid enough to hold light to medium weight storage. It’s also possible to make your own improvements to make the floor stronger. Bracing is a good example, or adding another solid sheet or two on top will also significantly enhance its strength and stability. 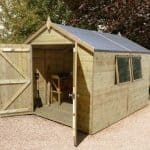 Traditional square cut overlap cladding is used to offer a budget shed with the highest possible quality. Square cut overlap is the strongest and most reliable out of the different overlap types. Compared to tongue and groove it may be more prone to warping, but this can be prevented with high quality spirit based treatments. Spirit based treatments will soak into the timber and provide a complete barrier both inside and outside the wood. They are more expensive but definitely worth the extra cost for the protection they provide. Saying that, a cheaper coloured water based treatment will also work well providing you are strict with the annual treatments. A standard framing size of 28mm x 28mm is used inside the building. 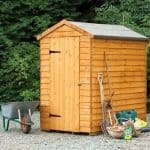 This is found on most sheds these days and it does ensure the structure of the shed is properly supported. All in all overlap does produce a very rough looking building, but it is the most affordable material for manufacturers to work with. The doors of this shed are braced which is pretty unusual in overlap buildings. They also open out to reveal a large, wide access space. This makes it simple to transport all kinds of storage; even the bulkiest tools and equipment. As there is less chance of them sagging thanks to the bracing, they should last longer than the doors found on some competitor models. They are secured with turn button catches which aren’t the strongest door fastener available, but they do the job and prevent the doors opening when you don’t need them to. This is a windowless shed so the amount of light inside the building isn’t great. This means you’ll either need to leave the door open whilst you are using it, or you could fit a solar light. If security is your main concern, you’ll be disappointed to see this shed doesn’t feature any kind of lock. However, you need to take into account that it comes at a very low price for its size. The cost of adding security isn’t going to be expensive. The fact there aren’t any windows does add to its security a little as thieves cannot see anything inside the building. So providing you do get a lock, your storage well be kept fully out of view and safer than it would in a shed with windows. There’s really only one thing you can customise with this shed and that’s the colour of it. Although it does benefit from a more stylish design than many other overlap buildings, you still might prefer a different colour. The good news is Waltons offers four different DIY coloured treatments to help you both customise and protect the timber. The colours include light and dark brown, Ivy Green and Cedar Red. They have a very high quality and are designed to be 100% safe to use around both plants and pets. There’s also one extra available in the form of a DIY Assembly Assistance Tool Kit. Not everyone will need this as it basically contains a lot of tools you will need to self-assemble the shed. If you do a lot of DIY or have done in the past, you will likely already own some of the tools included in this kit. However, if you haven’t done much self-assembly before then the hammer, spirit level set, brushes, safety goggles, saw and safety knife will likely come in very useful. It is important to note that these extras are sold on the manufacturer site and may not be available elsewhere. Different stores offer different extras so it could be worth shopping around to compare what is offered. This is one of the best quality, best looking overlap sheds available. Made from traditional square cut cladding, it offers a reliable, yet affordable building. Annual treatments will ensure this shed stands up to even harsh downpours and winds for many years to come. The additional maintenance required will ensure it lasts as long as a tongue and groove shed. As this is by far one of the largest sheds on offer, it does offer a substantial amount of interior space. The only thing that stops us giving it 10/10 is the fact that shelving cannot be installed. However, you could buy a standalone shelving unit if required. The installation process is simple, but its size means it will take longer to put together. It should also only be assembled by two or more people for safety purposes. 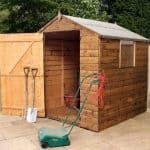 Considering the features and benefits of this shed, it offers great value for money. The only upgrades that may be required are not expensive at all. Final Thoughts: If you’re looking for a basic yet high quality storage shed, this Windsor overlap model is ideal. Offering superb value, it is a large building with a windowless design for privacy and security. It has more of a stylish look than many of its competitors and offers wide, spacious access thanks to the braced double doors. Whilst it isn’t going to offer the same level of protection against the elements as a tongue and groove model, this still comes with a great 10 year anti rot warranty. You just need to make sure you treat it annually in order to benefit from it.